went on to visual arts at the University of Windsor in until 1989. He currently resides in Guelph Ont..
and stirs an emotional response. 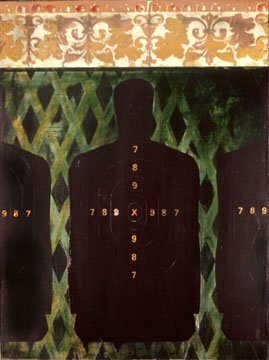 reality that the targets represent. what it really is , an abstract shape that when laid out in a pattern is unlike any other pattern. 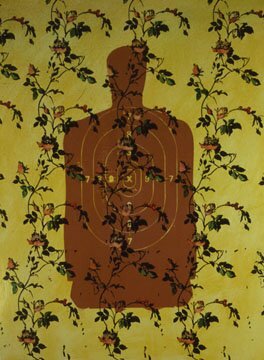 This work is a powerful combination of the shooting range silhouette and the most innocent of pastel colors (pink and blue). These colors provide a sense of soothing, until the viewer realizes that the iamge are that of a human skeleton. Buried deep within the crowd lies a singular, black, firing range target. This print of a floral vine over top of the human silhouette is powerful in its dramatic differences. The commonly used floral vine, climbing upwards, may be reminiscent of a funeral image. It is evident that no matter how deep the 'target' is integrated into the pattern it is still higlly visible and provides an emotionally charged response. 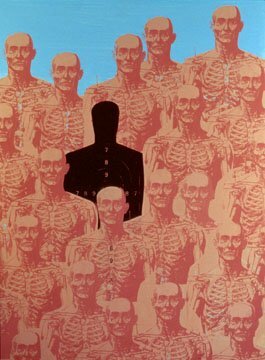 This is a series of three images of the human 'target' silkscreened onto paper with anatomical parts printed over top. 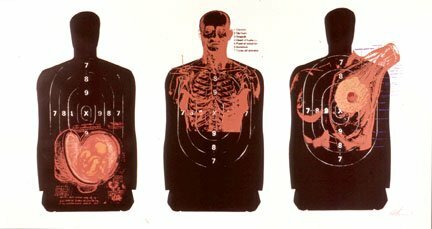 The three images duplicate the realistic repetitive use of the human silhouette at a firing range. The piece is highly emotionally charged by including a fetus, the female breast adn the male torso. The series of five human silhouettes focus on the anatomy of the human body. From left to right they represent the spinal cord, heart and rib cage, back muscles, heart, lungs and stomach and the arterial system. 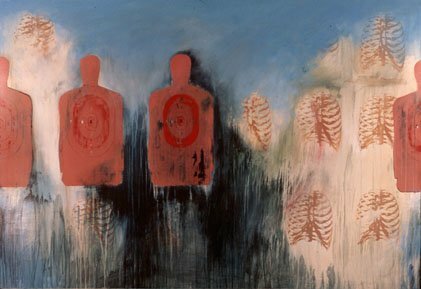 These images emphasize the medical reality of the potential physical destruction of the use of firearms. Each of these images represent one of the main and vital organs or systems of thehuman body.